Periodically we talk about "stacking mush". This is a term coined by phero66 back on Jan 30, 2007 in his POST with the same title. Stacking mush describes a condition in which stacking software is unable to determine which frames are in sharpest focus in part of the image, so that part ends up being constructed mostly from out-of-focus information. The problem becomes more common with deeper stacks and low contrast detail. I've written before that Zerene Stacker is less vulnerable to stacking mush than some other packages. Here is a particularly good example that I ran into last spring while photographing "High style of a maple flower". All images produced with default parameters, no retouching, no post-processing except for resizing and assembly into this panel. These images processed today, using Helicon Focus 5.0.6 and Zerene Stacker 1.02 Build T201002062230. To be fair, this is what I would call an "illustrative example". In other words, this is the most extreme case I've ever seen and I'm showing it to make a point. On the other hand, having now compared a lot of stacked results generated by various methods, I've come to think that stacking mush is actually very common but often goes unrecognized. I know that I'm frequently surprised to layer up a set of results, flash between them, and realize that what I thought was a nice result is actually missing a lot of detail that was in the original frames but never made it through to the final output. Whatever downsides it might have, ZS PMax hardly ever misses any detail, so it has become my standard of comparison. 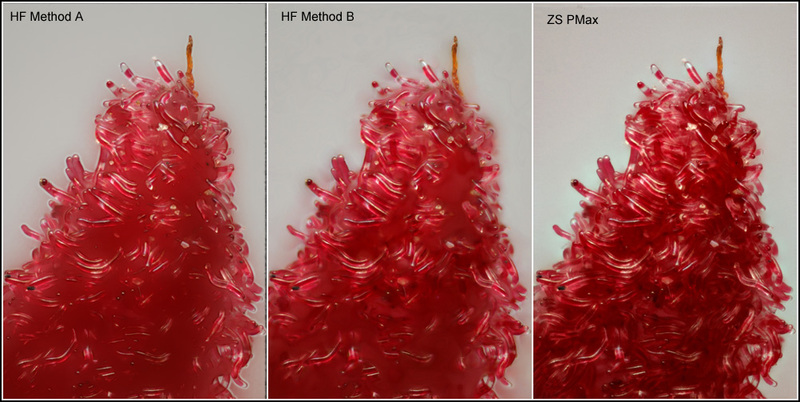 Even when I decide to use ZS DMap because of its lower noise and better colors, I always do a flashing comparison against PMax to see if there is some additional detail that I should think about retouching from PMax into the DMap master. BTW, in case you're wondering why I don't show a ZS DMap result in the above panel, that's because with default parameters, it's awful. With modified parameters, it works pretty well (somewhat better than I've been able to get by tuning HF), but setting the parameters is definitely a matter of "some experimentation required". I did do that for the big image in the "High style" post, and as noted there that image was generated by a combination of PMax and DMap. Rik - Impressive demo . I assume the stacking mush you are referring to is the missing detail in the middle of the flower rather than the haloing around the outside ? One of the main differences I noticed between zerene and the combine series was the ability of zerene to retain low contrast detail especially on flowers. I found out the same problem when I use more the 20 frames on CZP for sub millimetric FOV and low contrast even after fine setting the parameters. Only solution yet: splitting by batches the whole series. I will try ZS to test the difference. Cool info man! Thanks RJ. Mmmm More yummy RJ tidbits! I have yet to produce a usable image from Dmap, regardless of settings! There are always too many areas of lost detail (mush? ), and/or little areas of concentric "contour maps", which would need retouching. Putting Threshold more than zero has only ever made it worse. Maybe one day, though I usually don't run it.